This paper presents the thermal interpretation of quantum physics. The insight from Part I of this series that Born’s rule has its limitations – hence cannot be the foundation of quantum physics – opens the way for an alternative interpretation – the thermal interpretation of quantum physics. It gives new foundations that connect quantum physics (including quantum mechanics, statistical mechanics, quantum field theory and their applications) to experiment. 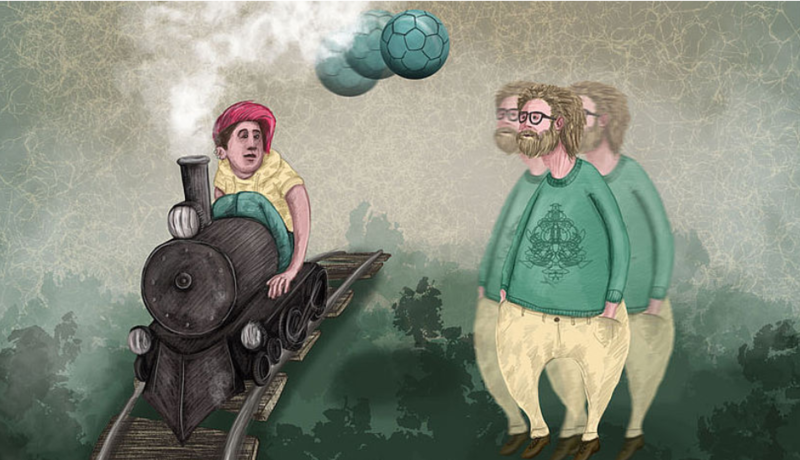 According to one of the most fundamental principles in physics, an observer on a moving train uses the same laws to describe a ball on the platform as an observer standing on the platform – physical laws are independent on the choice of a reference frame. Reference frames such as the train and the platform are physical systems and ultimately follow quantum-mechanical rules. They can be, for example, in a quantum state of superposition of different positions at once. So, what would the description of the ball look like for an observer on such a “quantum platform”? 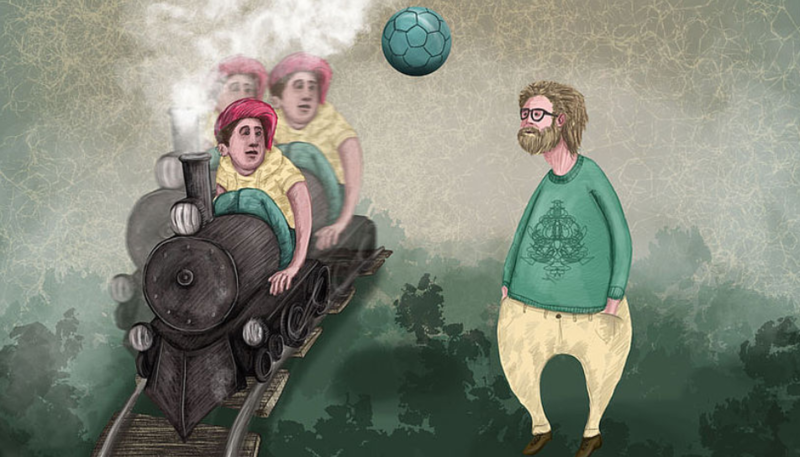 Researchers at the University of Vienna and the Austrian Academy of Sciences proved that whether an object (in our example, the ball) shows quantum features depends on the reference frame. The physical laws, however, are still independent of it. The results are published in Nature Communications. Entanglement between a rubidium-87 atom and a laser pulse leads to the creation of macroscopic superposition states. A rubidium-87 atom (blue sphere) is entangled with a light pulse that is in two distinct superpositions of phase states. A measurement of spin collapses the atom state and leads to the odd (top) or even (bottom) superposition state of the light. Erwin Schrödinger’s cat gedanken experiment of 1935 presented the possibility of entanglement between microscopic and macroscopic physical systems and the resulting quantum behavior of macroscopic objects. In the years since, researchers have realized analogous systems with entanglement between microscopic and macroscopic structures—for example, the entanglement between a trapped ion and the vibrational state in the trap described in David Wineland’s Nobel Prize–winning work. However, the resulting macroscopic quantum superposition states typically had limited utility because their creation had a low probability or they had short transmission distances. Now Gerhard Rempe of the Max Planck Institute of Quantum Optics in Germany and his colleagues have deterministically produced a macroscopic light pulse with a controlled superposition state. Rempe and his colleagues used a single rubidium-87 atom trapped in an optical cavity as the microscopic object and a laser pulse as the macroscopic cat. After putting the atom into a quantum superposition of up- and down-spin states, the researchers reflected the light pulse off the optical cavity. Although the light would not gain a phase shift for an atom in the up-spin state, it would gain one for the down-spin state. Because the atom had both up and down spin, the light experienced both phase shifts and became entangled with it. After rotating the atom’s spin by 90 degrees, the researchers measured the spin state, projecting it into either the up or down state. For a spin-up measurement, the light was in an odd superposition of the phase states; for a spin-down measurement, it was in an even superposition, as shown in the figure. 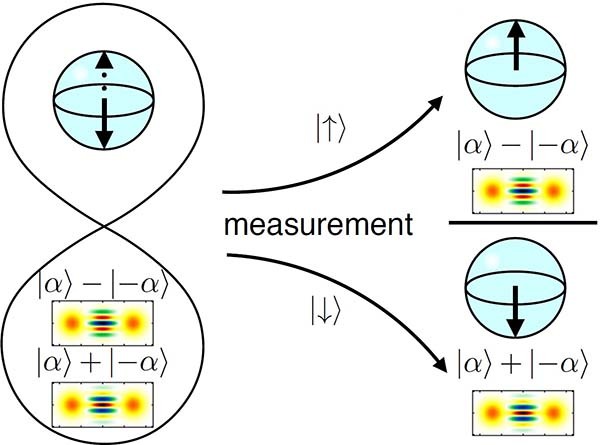 Rempe and his colleagues confirmed the creation of a macroscopic superposition state by measuring the probability distribution in phase space with a homodyne detector. Forthcoming exascale digital computers will further advance our knowledge of quantum chromodynamics, but formidable challenges will remain. In particular, Euclidean Monte Carlo methods are not well suited for studying real-time evolution in hadronic collisions, or the properties of hadronic matter at nonzero temperature and chemical potential. Digital computers may never be able to achieve accurate simulations of such phenomena in QCD and other strongly-coupled field theories; quantum computers will do so eventually, though I’m not sure when. Progress toward quantum simulation of quantum field theory will require the collaborative efforts of quantumists and field theorists, and though the physics payoff may still be far away, it’s worthwhile to get started now. Today’s research can hasten the arrival of a new era in which quantum simulation fuels rapid progress in fundamental physics. Nima Arkani-Hamed is a theoretical physicist with broad interests in high-energy physics and cosmology. He was educated at Toronto and Berkeley, held a postdoctoral fellowship at SLAC National Accelerator Laboratory, and was a professor of physics at Berkeley and Harvard before joining the Institute for Advanced Study in 2008. He was an inaugural recipient of the Fundamental Physics Prize in 2012, and was one of six physicists featured in the documentary “Particle Fever” in 2014. This article consists of a very short introduction to classical and quantum information theory. Basic properties of the classical Shannon entropy and the quantum von Neumann entropy are described, along with related concepts such as classical and quantum relative entropy, conditional entropy, and mutual information. A few more detailed topics are considered in the quantum case.